Argentinian musician based in Europe since 2002, specifically in Berlin since 2004. 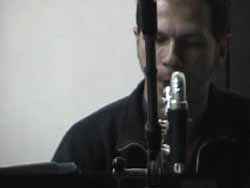 His main instruments are Bass Clarinet and Soprano Saxophone. After 10 years focused in Electro Acoustic Improvisation he dedicates in the last years, to works focused in the Perception experience, that he performs mainly in Solo and in the context of occasional collaborations. He composes his own pieces that may include improvisation and different ways of writing. He uses tools like Flying Speakers hanging from Helium Balloons, Speakers as Pendulums, Analog synthesiser, Sine Waves and Noise Generators, Drum Machine, Ultra-Violet Lights. He has also written compositions for different kind of Ensembles working the same aspects in the context of traditional Instrumentations.